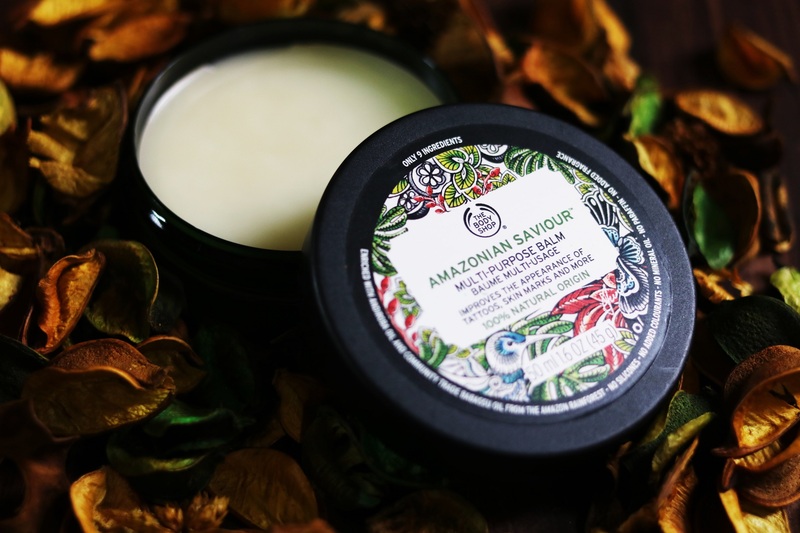 The Body Shop launched a bunch of new products last month and one of them is the Amazonian Saviour Multi-Purpose Balm. And it is probably the first ever product that enhances the appearance of tattoos. Whether it actually improves the appearance I can’t say because I am not a #GirlWithInk but what I am is a #GirlWithVeryDrySkin and thankfully this product works on nourishing dry skin too. 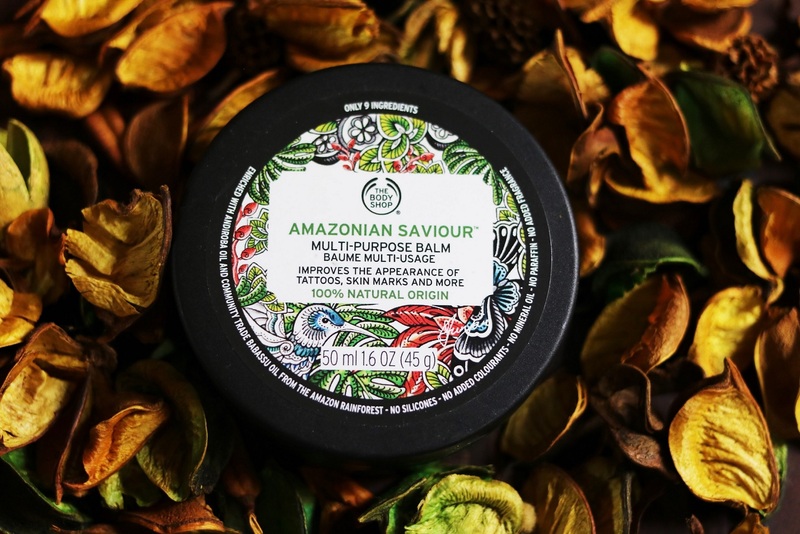 How does the new The Body Shop Amazonian Saviour Multi-Purpose Balm fare? Read on to find out. Packed with powerful natural origin oils and waxes, our Amazonian Saviour™ Multi-Purpose Balm helps to revive the appearance of tattoos, intensely nourishes severely dry skin and helps to improve the appearance of skin marks with a nourishing, 100% natural-origin formula. The story behind this powerful product begins in the heart of the Amazon. For centuries, different societies in the Amazon have relied on powerful natural ingredients to nurture damaged and tattooed skin. Inspired by the Amazonian communities, our Amazonian Saviour™ Multi-Purpose Balm is made with just nine natural-origin ingredients. Every sale of the Amazonian Saviour™ Multi-Purpose Balm will be used to help us build Bio-Bridges around the world, to support conservation and help communities to live more sustainably. 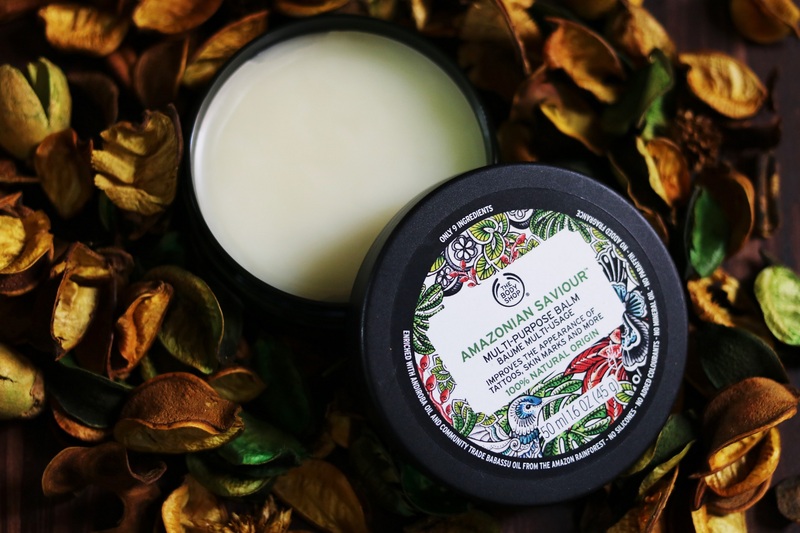 As the name suggests, Amazonian Saviour is a multi-purpose balm that heals dry skin and can be used on the lips, body, cuticles and even on tattoos, stretch marks and scars. The packaging is very attractive and credit for that goes to UK-based tattoo artist Saira Hunjan who designed the artwork. The texture of the balm is very similar to petroleum jelly. In fact, hard petroleum jelly. It does not have any fragrance, something I like. Even though the texture of the balm is quite thick, it melts into the skin fast and absorbs easily. I’ve been using it mostly to moisturise my lips, hands, knees and elbows – the driest areas of my body. What I like is that it does not turn the skin oily and greasy and the moisturizing effect lasts for a long time. I’ve been using the product on some of my stretch marks and scars as well. Have not seen any improvement yet but I guess on those it will take some time to show results. I have been carrying this compact tub in my handbag ever since I started using it and for this winter, The Body Shop Amazonian Saviour Multi-Purpose Balm is my best friend. If you have dry skin, definitely give it a try. 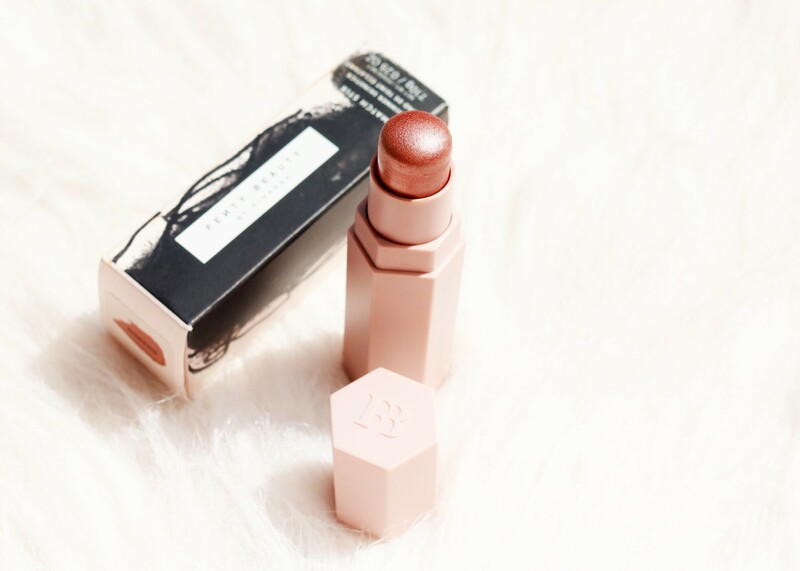 Undoubtedly, the biggest makeup launch of 2017 has been that of Rihanna’s Fenty Beauty. The permanent collection encompasses a foundation with a 40-shade range, one primer, two makeup brushes, three portable makeup brushes, one makeup sponge, one matte powder, ten shimmering highlighting sticks, 20 shades of matte contouring sticks, six powder highlighters, blotting paper, and one lip gloss. I was very tempted to get a Pro Filt’r Soft Matte Longwear Foundation but with 40 shades on offer with no chance of me seeing them live, I played safe and got a Shimmer Skinstick in the shade Sinamon. Here’s a fact about me. I’ve never been much of a tea or coffee person and I rarely have either of them for breakfast. I much prefer a glass of juice and therefore there’s always a carton in my fridge. 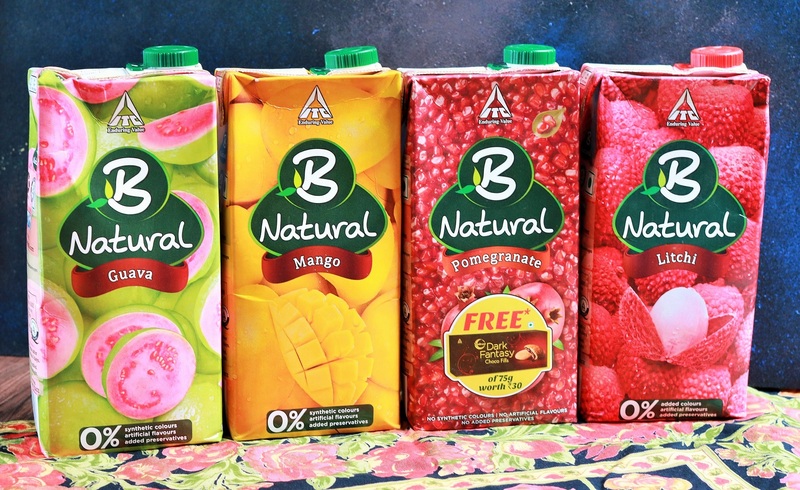 One brand that I’ve been loving recently is B Natural from ITC Foods and I was actually introduced to it by my mom. She tried the Pomegranate Juice somewhere and came back and told me how tasty and ‘real’ it was. 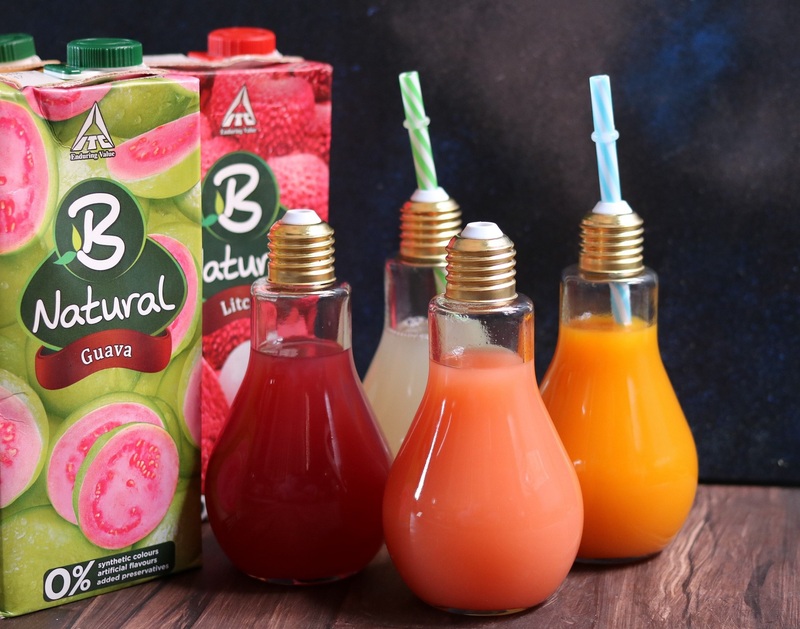 On our next monthly grocery shopping day, we came back with couple of cartons of B Natural’s Pomegranate and Mango Juice. And I’ve been hooked on to them since. Why do I like these juices? Because they are made from fruit and not from concentrate. When part of the water, is taken out from the fruit juice or pulp by heating, it becomes a concentrate. B Natural, ITC says, is made directly from pulp and not from concentrate. And therefore, you get that fresh fruit flavor in your juice. The brand also says that the juices contain “no synthetic colors, artificial flavors or added preservatives“. I cannot check those claims but I can say that they taste really good. 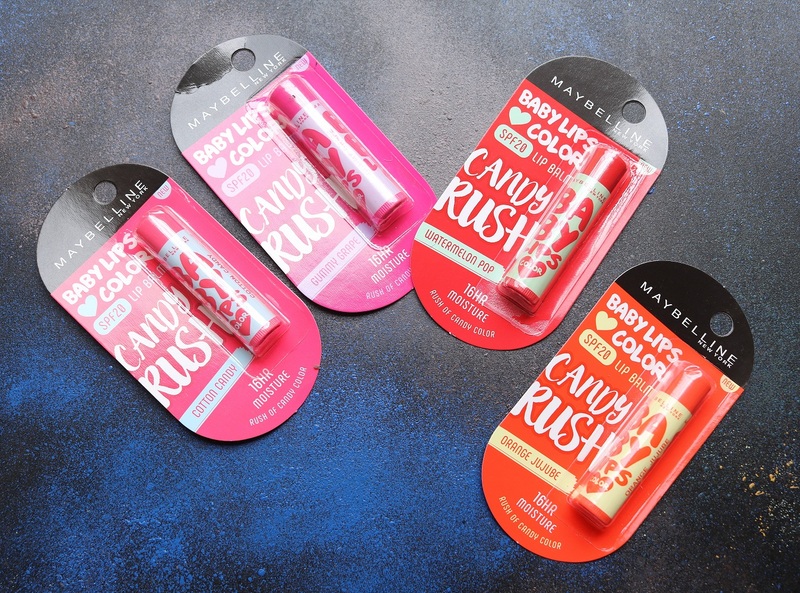 The Maybelline New York Baby Lips family keeps on growing each year and this time, the latest addition is the Candy Rush range. Why the name Candy Rush? Because they are not only named after candies but they taste of candy too! Yup, the new Maybelline New York Baby Lips Candy Rush is the first ever sweet tasting lip balm. They are priced at Rs 190 each and available in 4 lip smacking candy flavors – Watermelon Pop, Cotton Candy, Gummy Grape and Orange Jujube. Nowadays, I find myself leaning more towards natural, organic and ayurvedic products for skin and hair care. We all know about the ill-effects of parabens and SLEs so I am trying to avoid them as much as I can. 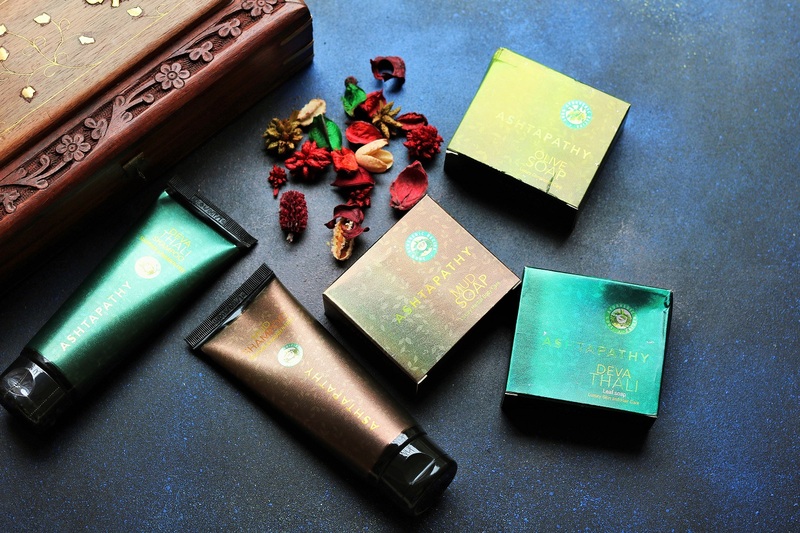 Recently, I was sent some products from the newly launched Ayurveda brand from Shesha Beauty, Ashtapathy, which has a range of coconut oil based shampoos and soaps. 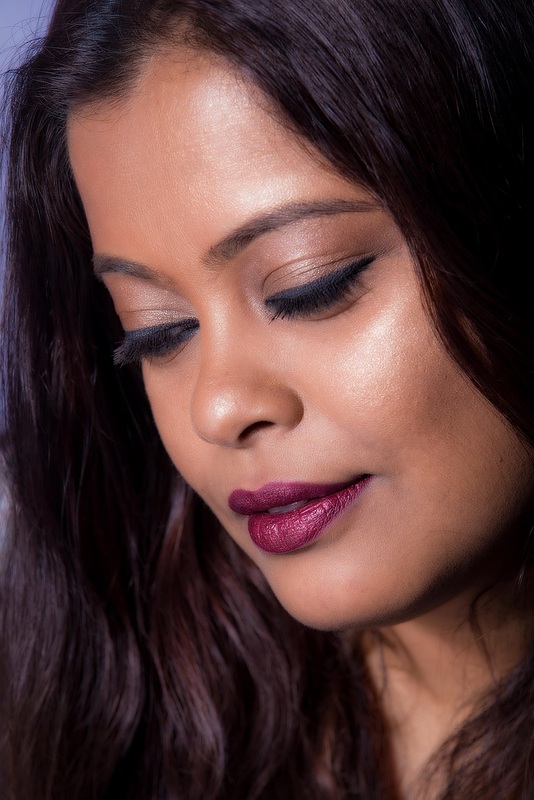 Harnessing tried and tested Ayurvedic beauty secrets is Ashtapathy. 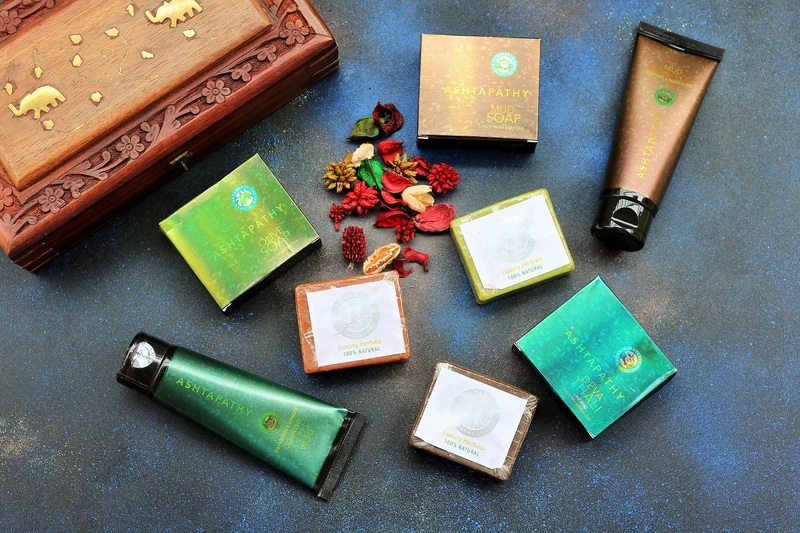 Ashtapathy Herbals is a herbal bath and body care brand from Kerala. In today’s times when purity in products is a rarity, Ashtapathy captures Ayurveda in its purest form and brings the same to you in a subtle way. All of our products are prepared with the pure and potent coconut oil as the base. The entire range is free of parabens, sodium lauryl sulphate, mineral oils, artificial perfumes and colour additives and are prepared from organically sourced medicinal herbs through a 100% natural process with the guidance of ancient Ayurveda scriptures. Ashtapathy Herbals also takes great pride in the fact that local women make up over 50% of our workforce and all the packaging etc are done through small groups of women across Kerala. We manufacture all products in our own plant at Cochin, Kerala. For more information on the brand and to buy the products, check out their website sheshabeauty.com.